Is your air conditioning unit making strange noises? Is it blowing out warm air instead of cold? It’s time to schedule Longview air conditioning unit repair with A/C Contractors. We are a great team to work with thanks to our friendly technicians, straightforward pricing and comprehensive guarantees. And, with our 24 hour emergency service, you can call us day or night. A/C Contractors is a locally owned and operated company that has been serving East Texas for over 25 years. 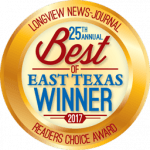 Below we share three great reasons for choosing us for air conditioning unit repair in Longview TX. Expert technicians. Our organization carries the Technician Seal of Safety. All technicians are trained, certified and professional. They are also given background checks and drug screenings at the time of hire. Honest, upfront pricing. Our Straight Forward Pricing guide makes budgeting easy. Refer to our guide for costs on any of our services – and forget surprises or hidden costs. Satisfaction guarantee. All Longview air conditioning unit repairs are backed by our Fixed Right or it’s Free guarantee. If your unit breaks down during the first year after making all recommended changes, we’ll repairit for free. Air conditioning units do not last forever. Their lifespans are around 10-12 years, but keep in mind that they run long and hard here in Texas. When suggesting a Longview air conditioning unit installation, your technician will consider the age of your unit, its efficiency and its performance. If all you are doing is making repairs and wasting energy with an outdated system, we will recommend an air conditioning unit installation in Longview TX. You’ll be glad you made the investment when you see how cool and comfortable your home can be – and for less each month! To schedule your appointment for Longview air conditioning unit repair, call A/C Contractors today!